UAE, Dubai, 19 March 2019: In celebration of ‘Italian Design Day', an initiative by the Italian Ministry of Foreign Affairs to promote Italian design around the world, Dubai was selected as one of 100 cities around the world to mark today's annual event. 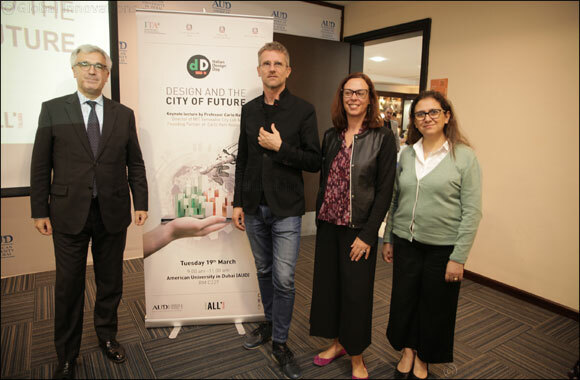 Professor Carlo Ratti, renowned Italian architect, engineer, prominent designer of Italy's Pavilion at Expo 2020 Dubai and ambassador of this initiative in the UAE, gave a keynote speech on Design and the City of the Future to VIPs and guests at the American University in Dubai (AUD) this morning. The event was held in partnership with the Embassy of Italy to the UAE and the Consulate General of Italy in Dubai. The Italian Design Day initiative was launched in 2016 to highlight the innovation and principals of Italian design to an international audience and is the third year that Dubai has been chosen to be part of the celebrations. It develops synergies between economic, cultural and scientific diplomacy thanks to the contribution of prominent personalities in the design industry. This year's theme focused on Internet of Things (IoT). The Internet is entering the physical space – the traditional domain of architecture and design – becoming an Internet of Things. This is opening the door to a variety of applications from energy to mobility, from production to citizen participation. As Director of the Senseable City Lab at MIT (Massachusetts Institute of Technology) and Founding Partner of Carlo Ratti Associati, Professor Ratti is a leading voice in the debate on new technologies' impact on urban life. His work has been exhibited in several venues worldwide, including the Venice Biennale, New York's Museum of Modern Art, London's Science Museum and Barcelona's Design Museum. Two of his projects – the Digital Water Pavilion and the Copenhagen Wheel – were hailed by Time Magazine as Best Inventions of the Year. He has been included in Wired Magazine's ‘Smart List: 50 People Who Will Change the World'. He is currently serving as co-chair of the World Economic Forum's Global Future Council on Cities and Urbanization, and as special advisor on Urban Innovation to the European Commission. Today's contribution from Professor Ratti addressed these issues from a critical point of view through projects by the Senseable City Laboratory, a research initiative at the Massachusetts Institute of Technology, and the design office Carlo Ratti Associati. Liborio Stellino, Ambassador of Italy to the UAE said, ‘The internet has transformed the way that we live. Technology is integral to the future success of modern society and Italy has some of the leading voices in the IoT field. Italian expertise and the vibrant and creative environment of the UAE are deeply connected. Just this week, Dubai has been listed among the world's top five cities when it comes to offering a positive experience for its residents through smart technology, showing the significant advancements this city has undertaken in recent years.